If industry and society as a whole don’t change, we’re headed down a dark path. Curious exactly where that path leads? Researchers around the world are analyzing just that — analyzing current data to put together projections of future greenhouse gas (GHG) emissions and their impact on the climate. Using estimations on future population levels, technology, economic activity, and social values, analysts try to reasonably predict “Shared Socioeconomic Pathways” (SSPs) and create carbon budget, global temperature, oil usage and energy demand, sea level rise, and carbon bubble scenarios. Here, we’ve created a list of important scenarios and what researchers say we should expect if we don’t make a drastic change. The Carbon Budget is an estimation of how much carbon can be released into the atmosphere before we reap the consequences of catastrophic climate changes. How long will it take to reach our ‘budget’ of GHG emissions and hit 2 degrees celsius of global warming? You can check in regularly with this Carbon Countdown Clock, which currently estimates we’ll hit our budget in 18 years with current emission rates. At the scenario with 1.5 degrees as the target temperature, we only have one month left. According to the Global Carbon Budget 2017, in order to avoid 2°C of warming, “global CO2 emissions need to decline rapidly and cross zero emissions after 2050.” In other words, not only must emissions come to zero, but must go into negative carbon emissions. Going below zero means that we are removing more carbon from the atmosphere than we are putting into it. The main way to achieve negative emissions is via BECCS or “Bio-energy with carbon capture and storage.” In layman’s terms, BECCS is using bioenergy, or burning plants to create electricity, as well as using plants as a natural way to sequester CO2. Most negative-emissions scenarios depend on BECCS and, according to a 2018 scientific study in Scientific Reports, the 1.5 °C carbon budget is entirely dependent on negative emissions. A worldwide temperature increase of only 2°C would have devastating impacts on the Earth, causing rising oceans, increasing forest fires, intense droughts, and other negative environmental impacts. The goals of the Paris Agreement are to keep the global temperature below 2°C for the long term future, however many are saying it’s not enough and won’t prevent severe warming. As of June 2018, Schroders predicts a temperature rise based on levels of global commitment and progress of at least 4.0°C by 2100. At this temperature, this will lead to a $700 billion rise in annual climate investment, negative impact on global companies, and a -10% impact on GDP in the long-term. The Climate Action Tracker predicts that the global temperature is likely to surpass 4.0°C by 2100, and could in fact be closer to 4.8 °C, while recent scientific forecasts suggest that in the next five years we’ll likely reach reach 1.5 °C above pre-industrial levels. We’re already beginning to see rising global temperatures. 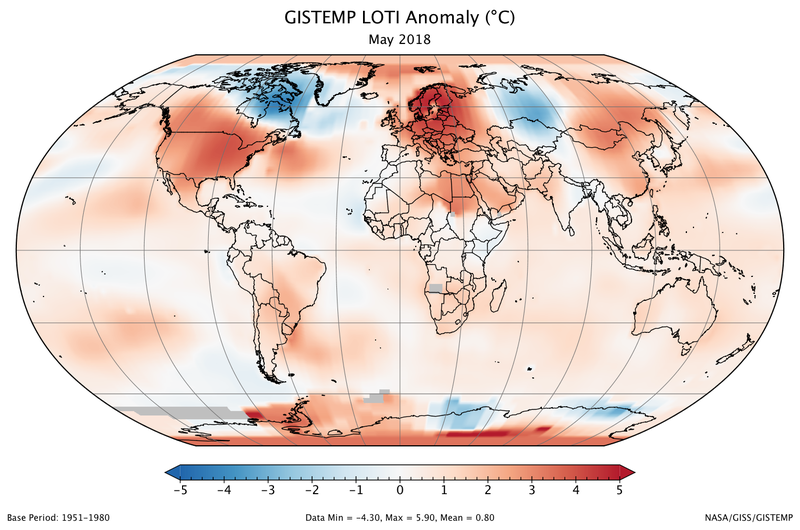 According to NASA and NOAA, May 2018 was the fourth warmest May on record and temperatures keep rising. 2017 was the hottest year on record, with extreme weather recorded across the globe. We can only expect more of the same. Oil and gas are major contributors to greenhouse gas emissions. As of June 2018, oil and gas investments are factoring to create a temperature scenario of 4.3 °C as estimated by Schroders. This amount of investments is not aligned to the Paris Agreement and has to decline sharply. Apart from many reports that have been exceedingly inaccurate (like the IPCC, IEA, also mentioned) the Bloomberg New Energy Finance Reports have made the best predictions and believes in 50% solar and wind by 2050 . According to a more recent report by IEA, World Energy Outlook 2017, global energy demand will grow 30% by 2040 and with a third of energy demand growth coming out of India. Oil demands will continue to grow, increasing to 105 million barrels a day. However, there is a growth of clean energy, with solar becoming the most affordable form of new electricity in many countries. The World Economic Forum prepared various ‘alternative futures’ for the oil and gas industry, which you can peruse here, but the main takeaway is that “the need for oil and gas to fuel global economic well-being for an expanding middle-class population in the developing world will increase oil and gas demand significantly over the next three decades, in spite of significant improvements in energy efficiency.” This is backed up by others, such as BP and the IEA, whose predictions contend that the world’s oil consumption will not peak until the late 2030s, despite the rise of electric vehicles and clean energy. Another prediction made in the International Energy Agency report is that the United States will come to dominate crude and gas production by 2040, due to major growth in shale oil. However they suggest that US shale oil will peak in the 2020s at 17 million bpd. Again, important to mention that especially the IPPC, IEA and Oil&Gas company reports (like those by BP) have been heavily criticized and often have a vested interest in certain statements. According to a recently published study by IMBIE, coastal cities need to be on high alert and expect to face dangerously high sea-levels in less than a decade. NASA scientists are calling this study “the most robust study of the ice mass balance of Antarctica to date.” Since 1901, ice losses and melting glaciers caused a sea-level rise at an average rate of 1.7 mm/yr. However, from 1992 to the present, the ice sheet has lost almost 3 trillion tons of ice, creating a sea-level rise of 8mm/yr. 40% of that has been in only the last five years. A recent study explains that as warm ocean waters carve out crevasses underneath the ice shelves, they crack, thin out, and break off in pieces into the ocean, causing it to rise. The sea-level rise could be more than 1cm per year. If polar ice-sheet loss doubles every ten years, the sea-level could rise one meter in 50 years. By 2100, 70% of coastlines will experience the effects of rising sea-levels. Periods of occasional stability will occur amidst rapid glacial retreat. According to a recent study by researchers from Radboud University, the University of Cambridge (C-EENRG), Cambridge Econometrics, The Open University (UK) and the University of Macau and published in Nature Climate Change, there is a sizeable Carbon Bubble. We’re going to update this article in a few months with recent reports and studies. Please leave us comments with interesting reports we may not have mentioned.